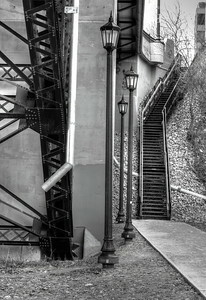 On the banks of the Humber River. 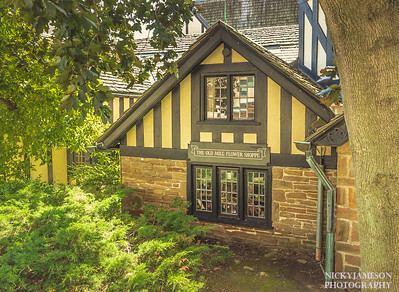 Old Mill Flower Shoppe. With the old architecture, sloped rooftops and leaded-lights window panes I had the feeling of an Old Worlde escape back in time. It's like an oasis you discover when you wander outside the urban limits. At the Historic Old Mill Spa. It'a beautiful place to stay as well and they do a lovely afternoon tea. 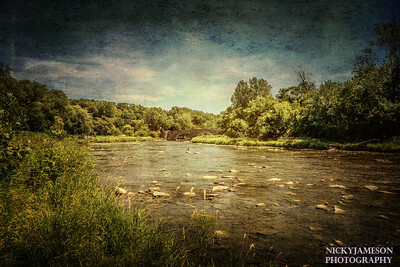 Beauty, rushing river, dreaming of rainstorms in summer and my painterly expression of the Humber at the Old Mill. It is interesting to see how different a place is from season to season. In spring the Humber is full and fishermen stand thigh deep in waders. 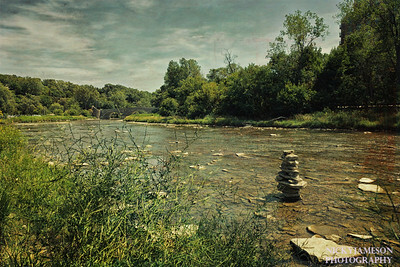 A hot Toronto summer brings lower water levels, so low it would be easy to cross to the other side on foot. I hope there is more rain soon. Rocks look like a face... The Humber River was so shallow that you could see the river bed. There were some fascinating rock artefacts in the river, this was one of them. From afar they looked like rocks piled up, but if you look carefully this one looks like a face. I found out it's an Inuksuk, a man made stone landmark used by the Inuit for communication and survival. The traditional meaning of the Inukshuk is :Someone was here" or "You are on the right path". wondered if it had been built since the water was so shallow, or whether it was only visible because of the water being so shallow. I think it's probably the former. There were several of them all very different.